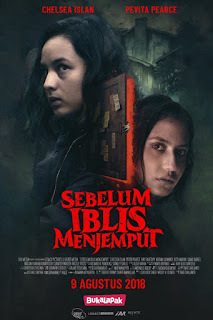 Originally released under the title Sebelum Iblis Menjemput (loosely translated as “Before the Devil Takes You”), 2018’s May the Devil Take You is Indonesia’s entry into the possessed horror genre, and although the movie has a few flaws, it nevertheless delivers plenty of genuine chills and creates tension through horror that American films tend to lack today. Writer-director Timo Tjahjanto has made himself a good rep in the action genre, with films such as Killers, Headshot, and The Night Comes for Us. But he’s also ventured into the horror genre, contributing a solid sequence (“Safe Haven”) for V/H/S/2 and, more importantly, 2009’s Macabre. Although some reviewers claim that May the Devil Take You pays homage to movies like Sam Raimi’s Evil Dead 2 (and this claim has some validity), this movie is actually more of a reinterpretation of Tjahjanto’s Macabre, repurposing character types and introducing possession, but one with an Indonesian flair. Although some may find the movie too predictable, given its genre choice, those willing to go for the ride will find that May the Devil Take You creates plenty of scares and tension to make for a most satisfying viewing. The movie centers on the family of Lesmana (Ray Sahetapy), a man desperate to provide financially for his wife and child. In an idiot move, Lesmana selects an ideal house (feng shui gone wrong) and hires a dark priestess (Ruth Marini in a chilling performance) to summon the devil. The cliché rolls out as Lesmana will give him and his family’s soul to the devil in exchange for wealth. However, it’s the way this happens that gives the sequence some startling flavor, with voodoo and ceremonial magic (with the theme of hair) making for an inspired and eerie sequence. As with most such deals, things go wrong. Lesmana’s first wife (well played by acting veteran Kinaryosih) is killed strangely (implied suicide but later revealed to be murder by demon), leaving daughter Alfie (Chelsea Islan) to grow up with wicked stepmother and actress Laksmi (Karina Suwandhi) and her children, Maya (Pevita Pearce), self-described “dork” Ruben (Samo Rafael), and youngster Nara (Hadijah Shabab, who simply does not have the acting chops to pull off her role). Moreover, Lesmana loses his finances (close to bankruptcy) and falls gravely ill, succumbing to a bizarre skin disease and other ailments. Long estranged from her father, Alfie pays him a visit at the hospital, where she is also reunited with Laksmi and her kin. Having suppressed what happened to her mother, Alfie begins to remember, prompting her to return to the now-dilapidated house, which is not only the place where the devil was summoned but also her childhood home. Following in her tracks are Laksmi and her brood, who are trying to find any leftover wealth Lesmana may have stashed in the house. The tension between Lesmana’s old and new family members begins to grow, but things get really complicated when a thing in the cellar is revitalized and in a cool sequence captures Laksmi, dragging her into the basement and possessing her. From this point on, all hell breaks loose, as the now-possessed Laksmi attempts to drag her children down into the basement, so that “fortune be paid with souls.” The bulk of the movie then goes for broke, with possessed Laksmi dispatched by her daughter Maya, who in turn becomes possessed and attempts to take out Ruben (in a creepy sibling love sequence that fortunately lasts only a few seconds) and innocent Nara. The Evil Dead 2 and Drag Me to Hell references come into play, with a The Shining riff played out in Ruben’s girlfriend Lily (Clara Bernadeth), who looks like she is coming to the rescue only to be murdered by possessed Maya. Although these sequences are enjoyable, it’s when the movie gets down to basics that things really move well. Through flashbacks, we learn the reason Lesmana lost his wealth and why he is eventually murdered and his entire family is caught in peril. There’s also an effective flashback that shows how Alfie’s mom died that will leave most mouths gaping. The principal problem with Tjahjanto’s movie is that it does rely on American topes to evoke some of its gore-laden scares. Raimi’s approach to horror does indeed set the stage for throwing up ichor-laden blood into people’s mouths, the point-of-view shots of demons moving from place to place, and the “deadite” look of the principal demon (itself likely inspired by Asian cinema, by the way). Although these sequences still work in Tjahjanto’s movie, they tend to bog it down, as these sequences have no storytelling prowess in the movie’s actual theme, one of the selfish parents who claim to care for their children when in actuality they are sacrificing them to a literal hell. Tjahjanto does not completely forget this theme, but the problem is that in evoking a sense of horror he forgets that he could have created a much more atmospheric, psychological flick that would have done the job much better. Still, Tjahjanto manages to create enough thematic elements to make for one hell of a ride. It’s when Tjahjanto uses subtle sequences that the horror elements really come to life. He has a knack for teasing a viewer’s eyes, evoking the disturbing and the terrible before actually rewarding the viewer seconds later. There are some startling sequences on display, as when Nara alone sees the demon’s claw clasp her mother’s ankle before dragging her into the basement or when Alphie sees the devil for a second wandering around the house’s main floor (it lasts long enough to be noticed but not long enough for a chuckle). These and other sequences fare much better in terms of freshness than the Raimi-inspired sequences, although these too manage to evoke some genuine chills. All the actors do well, with Chelsea Islan and Pevita Pearce as protagonist and antagonist carrying the bulk of the movie, with Karina Suwandhi also turning in a chilling yet subtle performance as the wicked stepmother. The supporting cast is not the best, with the actors coming off as amateur actors. At critical moments during the movie, their acting shows, taking the viewer out of an otherwise intense scene. As for the special effects, they are stellar, with the makeup effects for the possessed people and the gore effects (we’re talking buckets of blood here) both top notch. What’s interesting about the special effects here is that they work well for the storyline, creating horror and enhanced tension that no jump scare could ever achieve. 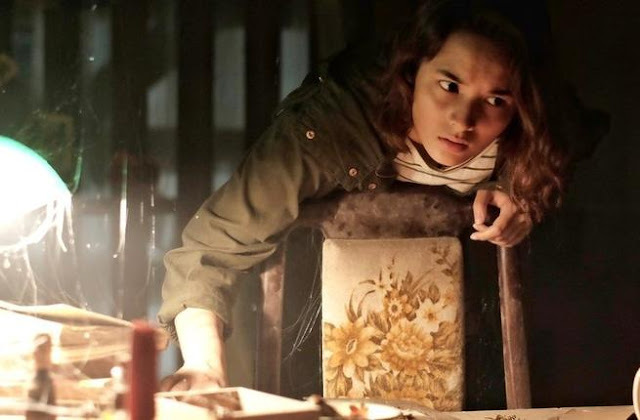 And bottom line, that’s what makes May the Devil Take You a stellar entry in the possession horror genre: There are no jump scares to be seen, only genuinely frightening sequences enhanced by explanatory moments that are quiet but chilling. When Tjahjanto introduces his own themes (such as how hair holds the soul and the Asian concept of how ghosts and demons are one in the same), this movie explores territory that few other films have dared explore. When Tjahjanto quits imitating American filmmakers and begins to let his own warped ideas come into play, then expect to see a tour de force horror flick. Until that time, give May the Devil Take You a chance. If you let it, it will scare the hell out of you. Note: This movie is in Indonesian but provides English subtitles.